" ... Zora had eyes to see the world and the wits to express what she saw" (87). No one can spin a yarn quite like young Zora Neale Hurston. Her imagination gives life to everything around her - flowers become royal guards, lightning bugs turn into fairie s, and ordinary swamp gators become shape-shifting monsters. She sees little Eatonville, Florida, in ways no one else does. Ten-year-old Carrie Jones, Zora's best friend, doesn't always believe her friend's tales, but she knows one thing: life's a whole lot more interesting with Zora around. Zora and Me, a fictionalized account of Hurston's childhood based on her stories and recollections, is a lush, magical story that celebrates the wonders - and dangers - of a child's imagination. The authors, Victoria Bond and T.R. Simon, do an admirable job of bringing the colorful writer to life while not romanticizing or glossing over some of the less pleasant facts of her girlhood (her father's explosive temper, for one). Zora is presented as a willful child, feisty and independent, who fearlessly insists on doing her own thing. Nevertheless, she's loved by the people of Eatonville, who enjoy her bright, curious nature. Tentative Carrie is the perfect counterpoint to Zora - she appreciates her friend's creativity while at the same time recognizing the dark side of Zora's constant flights of fancy. 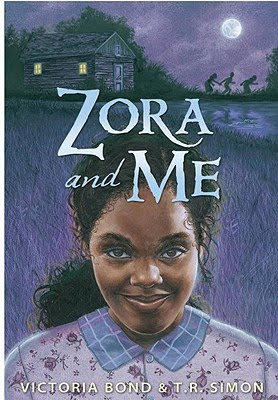 With a unique setting (Eatonville was the first incorporated black town in the U.S.), a compelling adventure, pitch-perfect prose, and a cast of warm, colorful characters, Zora and Me gets everything right. It's a tribute, a mystery, but, most of all, the kind of yarn that would thrill Zora Neale Hurston herself. *To learn more about the book, the authors and about Zora Neale Hurston, visit the book's excellent website here. To the FTC, with love: I received an ARC of Zora and Me from the generous folks at Candlewick Press. Thank you! I swear I'm going to read this book by the end of..March. haha. Did you see it was nominated for an Edgar Allan Poe award? I'm even more eager to read it now if the mystery is that good! Plus I'm curious about Eatonville and young Zora Neale Hurston. I wonder where the name Zora comes from?